Mankind has long had the ambition to fly, and throughout the centuries various adventurers have tried to get off the ground and stay there for a reasonable period of time before returning safely to terra firma. Some have had much loftier ambitions; one such was the Chinese daredevil Wan Hoo. It is often thought that the Chinese, who had invented “black powder” as early as the 9th century, only used it for making fireworks and inefficient firearms that were as likely to kill their possessor as the intended victim. However, by the 14th century their rocket science had advanced to the point of developing multi-stage rockets that could deliver multiple warheads at a considerable distance. The principles that they had developed are very similar to those used to this day in missiles and space rockets. However, they were nowhere near ready to launch a manned mission to the Moon in the year 1500, but that was what Wan Hoo had in mind! 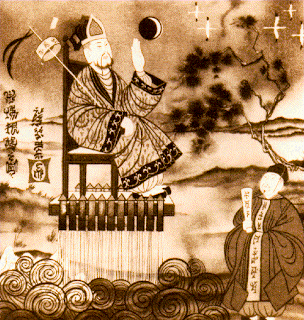 Wan Hoo (sometimes transliterated as Wan Hu) was an official of the Chinese Ming dynasty who believed that developments in rocketry had reached a stage of development that justified an attempt at manned space flight. To be precise, he believed that he could fly to the Moon. Wan Hoo’s idea was that he would sit in a wicker chair to which 47 rockets had been attached. The rockets would be lit by 47 servants so that they would all fire at the same time, and the force would be sufficient to send him to the Moon. Whether he had thought of how he was going to get back again is another matter, but, as things turned out, this was not going to be a problem he would have to solve. On the appointed day, Wan Hoo walked to his chair dressed in all his finery. He clearly had not got the faintest idea about conditions between the Earth and the Moon, hence the lack of any “space suit”, and he probably imagined that the distance involved was only a few miles. He waved to his servants to light the fuses, which they duly did, and everyone waited for “take off”. What they got was a massive explosion as all the 47 rockets ignited simultaneously. When the smoke cleared there was no sign of the wicker chair or Wan Hoo, neither of which was ever seen again. No doubt there were people present who imagined that the experiment had worked and that Wan Hoo was now sitting, in his chair, on the Moon. In 2004 an attempt was made to replicate Wan Hoo’s “space flight”. This was filmed by the Discovery Channel for their “Myth Busters” programme. Everything was done to copy the circumstances as closely as could be managed, based on the written records from 1500 and modern knowledge of Chinese technology at the time. The only volunteer willing to take the place of Wan Hoo was a crash-test dummy called Buster. The result of this fresh experiment was remarkably similar to what contemporary accounts say happened the first time round. There was a huge explosion after which there was no sign of the chair or Buster. However, a closer look around the site revealed small pieces of charred wood, metal and plastic that had once belonged to the chair and the late lamented Buster. The unsurprising conclusion was therefore that Wan Hoo did not end his days on the Moon but in very small pieces deposited around his Chinese launch site. It is not thought that anyone else, in China or elsewhere, was ever tempted to repeat Wan Hoo’s attempt. Was Wan Hoo a pioneer of something else? However, although this was clearly not the right way to get to the Moon, Wan Hoo might have been on to something in terms of developing the “jet pack”, or a means of taking off from the ground with rocket or jet engines strapped to one’s back. This has been proved to be possible in recent years, although there are still huge problems with the technology. Had Wan Hoo’s ambitions been somewhat less extreme, and had he decided on igniting a much smaller quantity of explosive material close to his person, he might even have lived to tell the tale.